Norwegian-Uruguayan Alexander Vik’s stunning addition to his collection of South American contemporary art hotels is a breath of fresh air to the discerning traveller. Choose from one of the six rooms that all feature gorgeous works of art and are sure to keep all art aficionados infatuated. The central building of Playa Vik is aptly nicknamed ‘The Sculpture’ for its gravity-defying structure comprising titanium and floor-to-ceiling glass panels that capture Jose Ignacio’s magnificent coastline. Plus, with a 40-foot long wine cellar that houses up to 5,000 bottles of the continent’s finest wines, including Vik’s own blend, there’s plenty to keep you entertained and relaxed in equal measure. 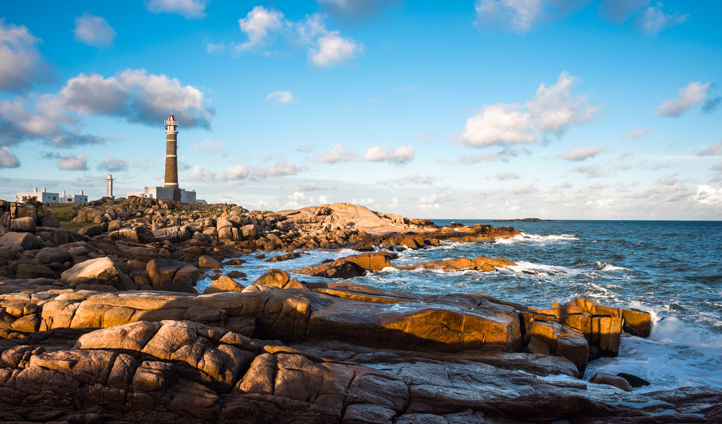 Just a two-hour drive from Montevideo International Airport and passing trendy Punta del Este en route, you will reach Playa Vik. 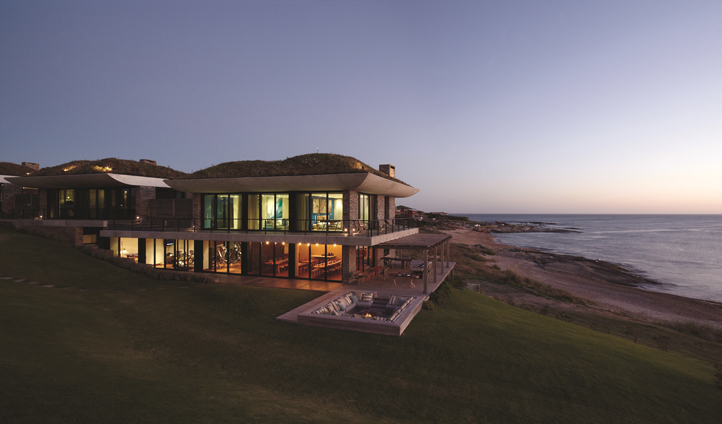 Standing above the shores of Playa Mansa at Jose Ignacio, your oceanside retreat awaits you. Take a stroll along the endless sands to find a restaurant that serves the freshest fish daily or have a beach bonfire with friends before returning to dine at Parillero under a ceiling made of canes. If quirky architecture is your thing, take a 10-minute drive along the coast to Puente Laguna Garzón, famed for its circular shaped lagoon crossing. Designed by Rafael Viñoly, who also lays claim to London’s Walkie Talkie, the structure allows people to enjoy the panoramic views by slowing the speed of cars. The central building houses four magnificent suites, our favourite being the Atrio Suite, with its intimate interiors and enormous glass wall that allows light to flood in. The bathroom is a distinctive blend of Zebrano wooded walls and an Agatha pebbled floor, making for a luxurious experience. Beyond The Sculpture, you’ll find six casitas laden with local flora on their living roofs, and that offer an indulgent and unique stay, complete with floor to ceiling windows and wooden canoe bathtubs. The collection of contemporary Uruguayan and international art dotted throughout Playa Vik makes each room even more exciting than the last. It even features furniture designed by the legendary Zaha Hadid. Every part of this hotel is unique and the attention to detail is impeccable. Forget the beach, enjoy that Uruguayan sunset from the black granite infinity pool that, upon nightfall, glistens with a fibre optic map of the southern hemisphere’s night sky on its floor. Simply look up and see its mirror image dancing in the sky. We also love the iconic ‘brasero’ fire pit overlooking the dining area – dreams of sitting here all day long are soon made reality. Couple Playa Vik up with its Estancia sibling just up the road and you have the perfect beach-country retreat.